There’s a reason Mike Teti has come back to the Head of the Charles almost every year since 1978. The three-time Olympian recently stepped down from his position as the men’s crew coach at University of California to become the USRowing men’s head coach — a position he held for 12 years prior to his tenure at Cal. Teti said his decision to take back the reins at USRowing was motivated by a desire to strengthen the program. “I saw this really great opportunity to get back involved with the national team and try to develop a sustainable program, where we can consistently be producing medals,” he said. USRowing has three men’s boats competing at the Head of the Charles this year: two in the champ eights and one in the champ fours. They’ll be up against stiff competition from tough university programs — including Cal, his former team — as well as formidable international boats. 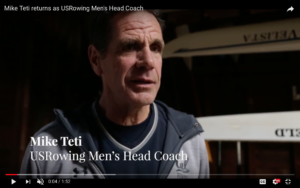 The Head of the Charles media staff recently caught up with Teti to discuss his coaching career, his personal love for the regatta and his hopes for Sunday’s races. CLICK HERE or on the image below to watch the interview.